Official synopsis: "I didn't ask for any of this. I didn't ask to be some kind of hero. But when your whole life gets swept up by a tornado—taking you with it—you have no choice but to go along, you know? Sure, I've read the books. I've seen the movies. I know the song about the rainbow and the happy little blue birds. But I never expected Oz to look like this. To be a place where Good Witches can't be trusted, Wicked Witches may just be the good guys, and winged monkeys can be executed for acts of rebellion. There's still the yellow brick road, though—but even that's crumbling. What happened? Dorothy. They say she found a way to come back to Oz. They say she seized power and the power went to her head. And now no one is safe. My name is Amy Gumm—and I'm the other girl from Kansas. I've been recruited by the Revolutionary Order of the Wicked. I've been trained to fight. And I have a mission: Remove the Tin Woodman's heart. Steal the Scarecrow's brain. Take the Lion's courage. Then and only then—Dorothy must die." And then my copy came and I dove straight in. The cover and the overall package of the book is brilliant. You can instantly tell it's about Oz regardless of whether or not you've read the synopsis. Front and centre is the trademark blue and white chequered dress made famous all those years ago. The book itself is very well designed. I have to say that when the book first gets to Oz it is quite slow. A lot of groundwork is laid out. Back story. Oz is in a state of disrepair. It's dark. It's malevolent. It's broken, and it is all Dorothy's fault. She's sucking Oz's land of all of its magic so that she can control it. The world of Oz is twisted. Sick. The characters are too. Gone is the lovably bashful Lion, he's a dark, menacing creature who preys on fear. The Scarecrow is conducting horrific experiments and the Tin Woodman... Well, lets just say he's had a few modifications. But then about three quarters of the way through the pace really kicks in as the action sequences begin to take place as Amy tries to carry out the mission she has been given. To kill Dorothy. These scenes were my favourite from the book because they actually got me excited about the story. Before that I had struggled so hard to actually give a damn. It was almost as if I was reading a different book all of a sudden. I just didn't gel with the voice of Amy, and even now after finishing the book I still don't know that I 100% get her or even like her as a character. The love interest in the book, Nox, also didn't seem to intrigue me. The romance between the two seemed so sudden and almost unnecessary. One minute they had only just met, and the next Nox was helping two friends who were in trouble and Amy was jealous. I mean... WHAT?! I don't get it. It's a scene which still irks me and it's been a few weeks since I actually finished the book. I just don't get her as a character, her thoughts, her motives. And then the book ends. It was kind of a cliff hanger but for me I don't know if I liked the ending or not. It didn't necessarily make me excited for the second book but it did show that there is some promise left in what is now a trilogy where I had thought there would be none half way through reading this book. I'm kind of on the fence if I am completely honest. I liked some aspects of it but then there aspects that annoyed me so much. And it is such a shame because there is no denying the fact that Danielle Paige can write. Some of the book is beautifully written and there is obviously talent there, but I just can't help but feel there are forces higher up the chain that are having an affect. It was only a few weeks after finishing the book that I found out it's the brainchild of Full Fathom Five. A company run by James Frey - the man called out by the Queen of interviews Oprah for being a liar and fabricating large parts of his so called memoir. The company itself doesn't have a very good reputation. Basically they hire writers to write their ideas for them and they get a (very) small wage. For me, personally, it detracted from it. It has almost put me off reading the sequels, I'm still very undecided. I wouldn't say don't read this book, but I also don't know if I can genuinely recommend it to anyone either because it feels morally wrong as well as the fact that I just didn't really enjoy it as much as I had hoped. Maybe it'll be a slow burner? Maybe now all the world is laid out book two will hurtle along and take me by surprise? Who knows? We'll just have to wait and see. 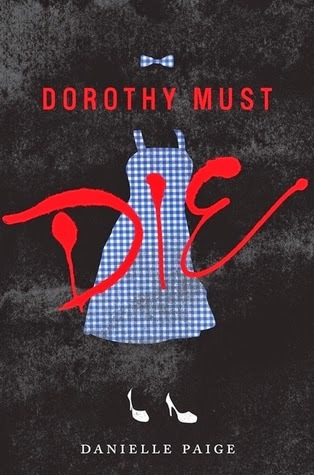 Have you read Dorothy Must Die? What did you think about it? Comment below, I'm interested to see if it was just me (a quick check on Goodreads says it isn't...) and also, what do you think of all of this Full Fathom Five business? Does it put you off reading a book? I've seen a lot of blog posts recently and seen that quite a few people boycott any of their releases which is something that intrigues me!